Question: What is the true width/depth? It can't be 39 x 36. Also, does this have a full basement option? 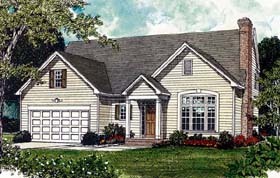 Answer: We have a walkout basement version of this plan, but not a full basement. Our number for the basement version is 85661. The width/depth must be listed incorrectly. It’s 50’ – 0” x 39’ – 0” and has been corrected on the website.